The 54-year-old man who jumped out of a freezer and threatened employees with a knife at a New York City brunch spot and then died was a suspected cold-case killer who had just been released from jail in Boston, authorities revealed on Monday. 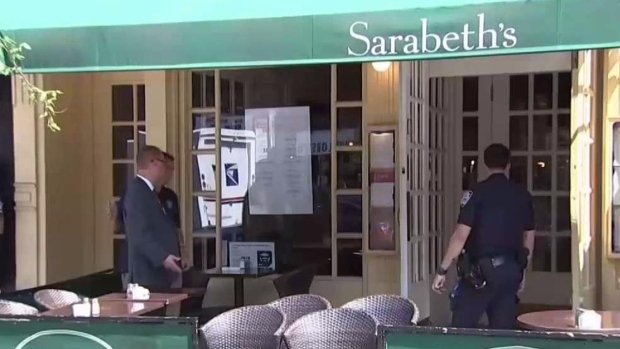 Authorities identified the man in the bizarre case as Carlton Henderson, who was found in the freezer at Sarabeth's Restaurant on the Upper West Side around 11 a.m. Sunday — about three hours after it opened for the day. Henderson shouted, "Away from me, Satan!" as he rushed out of the freezer, police said. He then grabbed a knife and attacked employees, who were able to disarm him. Henderson then went into cardiac arrest and died. Police arrested Henderson in St. Louis, Missouri, in June 2017 after bullets from the Boston killings were matched to a gun recovered in a fatal shooting in Miami in 1993. He was indicted on two counts of first-degree murder for his alleged role in the May 7, 1988 homicides of William Medina and Antonio Dos Reis in Boston. Both victims were in their 20s; Henderson would have been slightly older at the time. The case had been cold for decades, but it was reopened by a cold case squad in Boston and the indictment followed. A man was hiding in a freezer in Sarabeth's restaurant, then attacked employees with a knife. Ida Siegal reports. The case did not have a trial date, and Henderson's attorney had filed a motion to suppress evidence. The motion was granted last week and the judge reduced his bail as a consequence of that, authorities in Boston said. Henderson was released on his own recognizance Aug. 1, four days before the freezer attack. It wasn't clear what his connection was to the restaurant, why he was in the freezer or for how long. No employees were hurt.